Injured by 3M Dual Ended Ear Plugs? The Dual-Ended Combat Earplugs were standard issue for our armed services between 2003 through 2015. The earplugs were given to our service men and women while being known to be defective. These earplugs put our service members at risk of permanent hearing loss, damage, impairment and even Tinnitus. Claims against 3M state that the device did not function as described. The ear plugs were not long enough to be properly inserted into a service member's ears. Gradually, the earplugs will loosen and be completely useless to the user. 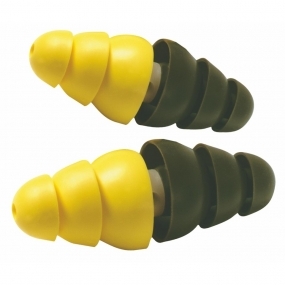 The Dual Ended Combat Earplugs were designed to be used as regular earplugs or they could be flipped around. By inserting the other end, the user would be able to hear as normal while protecting themselves from loud noises, such as gunfire or explosions. 3M and Aearo had become aware of the problem with these earplugs in early 2000. These plugs failed numerous safety tests, but the company still sold these products to the US government. Characterized as ringing in the ears. The volume of the ringing can vary from person to person. Tinnitus is the most common disability among veterans due to the exposure of being around loud noises such as jets, helicopters, gunfire, explosions and heavy machinery. The earplugs were suppose to provide protection from loud noises such as these. But being a defective product, many personnel become very vulnerable to the damages these noises can create. Hearing loss can be a long-term or even permanent effect from using the earplugs. It is reported that Hearing Loss is among the top most medical conditions for military service men and women. Hearing loss has the potential to be an untreatable condition even when using devices such as hearing aids.